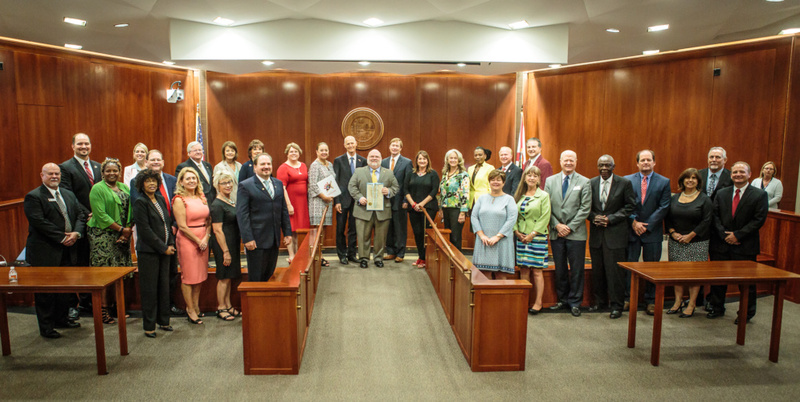 The Governor and Cabinet recognized Florida Tax Collectors for their Kids Tag Art Program which has raised over $1million for Florida schools through artwork sales and business contributions. 100% of the funds have gone directly to classroom arts education. Over 165,000 students have participated in Kids Tag Art since the program’s inception in 2006 in Polk County. Kids Tag Art brings the government and private communities together in supporting schools. Business and community leaders are recognizing increasingly the value of an arts education in preparing children to be successful in the market place by emphasizing creativity, problem solving and innovation. [I]ts dedication to classroom arts education and remind all Floridians to support their local Kids Tag Art programs as a way to raise funds for classroom art supplies, to provide a recognition program for spotlighting artistic and talented students, and to highlight the importance of creative self-expression and innovative problem-solving through arts education. We have a great team of business partners and sponsors who have generously supported arts education in our schools through this creative program that brings value to all involved. As we know, students who participate in the arts have higher test scores and are more likely to graduate high school and enter the workforce as innovative thinkers for today’s complex world. Art provides the context for creative problem-solving, the number one skill that Fortune 500 firms hire for today. Each year, 25,000 students create unique vanity license plate designs and may submit their work to Tax Collectors in each respective county. Award designs in each county are announced to the public on the various Tax Collector websites. Student artwork is also made available for sale to the public in the form of vanity plates, bike tags, key fobs, mugs, mousepads, etc. With the help of generous community and business sponsors, 100% of the monies raised from the sale of tags goes back into the classroom for much-needed supplemental funding. Earlier this year, the Florida Tax Collectors’ Kids Tag Art Program was recognized by the Florida Department of State, receiving the coveted Diversity and Inclusion Award for 2018. This award honors organizations who work to make arts and cultural programming in Florida as diverse and inclusive as possible. The Florida Department of State was pleased to honor the Kids Tag Art Program with a 2018 Diversity and Inclusion Award earlier this year to recognize their innovative and exceptional efforts to support arts education,” said Secretary of State Ken Detzner. “This is an incredible program that blends the creativity of Florida students with the generosity of local communities and the results speak for themselves. The Governor and Cabinet recognized Kids Tag Art as a glowing example of cooperation between the government and private sector to support the education and children in the community. The program recognizes the importance of creative expression and problem-solving skill development. Kids Tag Art is a great program and is supported by business in each community for this very fact.